As personal data-related incidents become more common and breach notification requirements vary across regions, privacy and security teams need a flexible solution to centrally manage response plans across the globe. Today, OneTrust announced the launch of a new Incident & Breach Response solution integrated into the OneTrust Privacy Management Platform. The solution is integrated into the OneTrust Privacy Management suite, providing teams a simpler way to bridge their incident and breach response plans into existing privacy efforts such as data mapping and vendor management. By allowing organisations to intake, analyse, investigate, report and monitor incidents, OneTrust Incident & Breach Response helps privacy and security teams manage the full lifecycle of personal data incidents and automatically tailors response workflows based on impacted regions’ breach notification laws. Companies can manage breaches and increase accountability by assigning risk owners, setting deadlines and maintaining a complete response audit trail for compliance purposes. The solution can integrate into a company’s related applications, such as data loss prevention, threat intelligence, GRC, SIEM and ITSM tools. 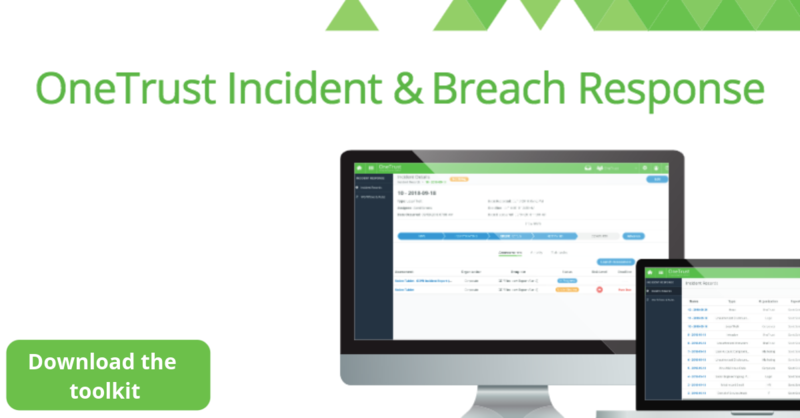 As there continues to be new and updated breach notification laws, OneTrust Incident & Breach provides teams with a flexible solution to properly respond in the event of an incident or breach. To stay up to date on news, visit our LinkedIn, Twitter and Facebook. Ready to get started? Request a demo today.